This model from Presto, Presto 07072 Slimline Griddle has an extra large cooking surface of 22”x13” made of stiff and durable cast aluminum, which is light, quite rigid and good for heating evenly. The cooking surface has a nonstick coating that reduces the amount of oil needed and much easier to clean. Since its handles are detachable, there is no big hassle for its storage. 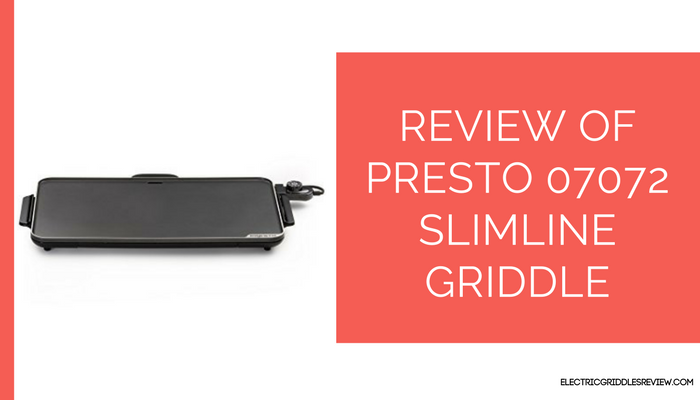 This Presto griddle is simply great for big meals either breakfast or lunch or dinner. This features a large cooking surface of 22”x13” allowing you to prepare food for your family all at once. 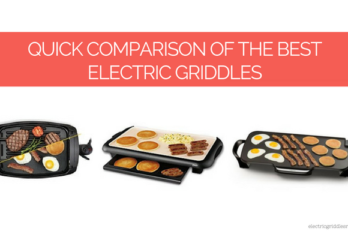 Despite its features, this electric griddle is budget-friendly. It has very easy to use removable temperature control, which makes the cleanup process quick and easy. The cast aluminum surface is nonstick that makes you’re your food more healthy with less use of oils and grease. The surface is very durable which can easily run for years cooking you hundreds of meals. It is low-profile buffet server. Also, the cast aluminum surface is virtually warp-proof. The large cooking surface of this Presto electric griddle allows you to make a whole batch of pancakes, bacon, eggs, and grilled cheese at the same time and please your family. The cooking surface is level and heat evenly across the griddle. There is no chance of your food sticking and burning because the cooking surface is non-stick. It has very easy temperature control and so simple to use. The removable heat control allows you to clean the surface easily after the use. It’s rated 1500 watts of power and that works with any 120v outlet. Temperature can be regulated by a temperature knob, it maintains even heat ranging from an undefined ‘warm’ up to 400ºF. The Control Master technology keeps the surface at a consistent temperature, which allows the even heating. Users really appreciated its quick heating up and cooking. It also has the drip tray that catches all the fat and grease spilled over the surface. The removable temperature gauge makes the cleaning easier. The whole thing can be immersed in water after removing heat controls. The slide-out grease tray makes the clean up easier in spite of its larger cooking area. 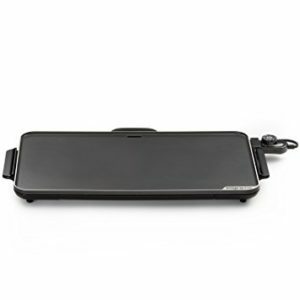 Storage can’t be more of an issue because of its slimline design; this Presto electric griddle with removable handles should fit in most standard kitchen cabinets. This is an ideal griddle for those who have large families and have to cook a lot of food at once. Its slimline design makes it easy to fit in the cabinet. 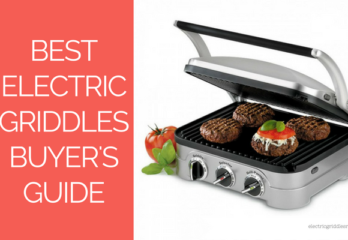 It goes up to 400 degrees to cook a variety of foods. The drip tray is very light.